Zoom in on the world’s largest island and you are blinded by the vast ice sheet which covers 80% of the land. and feeds mainly off what they find in nature. Yet, along the West Coast, you will find some of the world’s most superb hiking terrain, in a labyrinth of fjords & mountains, accessible by boat only. Everywhere you look, you see the island’s architect - the ice - in action, forcing gigantic glaciers to calve colossal icebergs into fjords. Tundra vegetation is populated by Arctic wildlife such as musk oxen, caribou, polar hares and arctic foxes. From a priviliged position on the water, whales, seals and mythical narwhal might be spotted. Greenland is an outdoor eldorado which dwarfs mankind and treats with nice Summer weather. 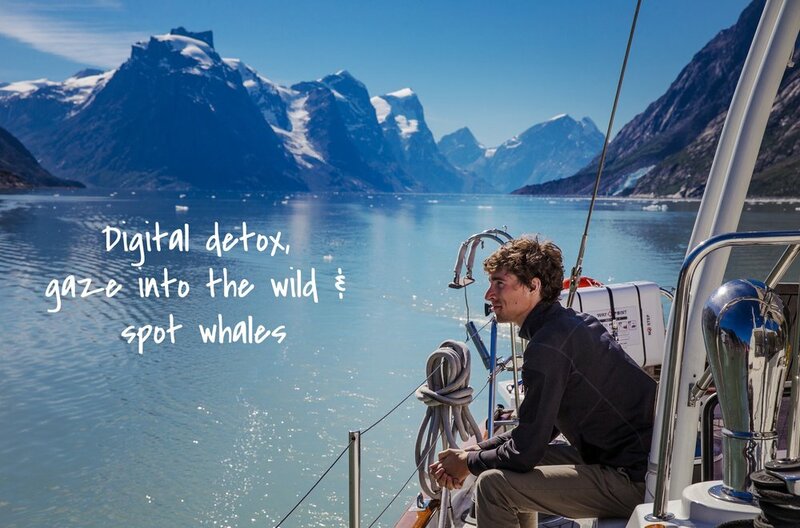 Sofie spent 4 months sailing & hiking in Greenland where she guided 7 groups of Puffins. She has extensive experience as mountain walking guide in Scandinavia and is a true people’s person with a big smile and inexhaustible energy, yet a modest & calm personality. She will make you experience surprising things you would not have considered and will listen to you like a genuine friend. Sofie is a dedicated and honest go-getter with a clear vision on how tourism should develop in a professional, sustainable way with fair prices. When she is not guiding, this seabird hosts guests in her B&B in Knokke. Connecting people to each other and our beautiful planet is her drive. A climate physicist by education, and an adventurer at heart & mind. He loves to share his skills & passion about the great outdoors. In 2020, Gilles will attempt a titan challenge with his Greenlandic Triathlon: cross the inlandsis in wintry conditions, paddle a 1000 miles around the wild Southeastern coast and climb some of the highest big walls on earth. Very few outdoor athletes show such versatile skills as Gilles does. Gilles spent several seasons in a row guiding in Southern Greenland. Puffins suggests 10-day itineraries and has extensive terrain expertise along the West Coast of Greenland in the fjord systems of Eternity Fjord, Ilulissat, Disko Island & Uummannaq and Tasermiut Fjord & Cape Farewell in the South. Have a look at the photo albums of our previous editions to get a feel of the respective areas. This trip classifies as type “Expedition”, which means your accommodation is a comfortable sailing yacht. Every day, you return to the yacht as your safe basecamp, where you enjoy hearty meals, a good bed, a shower and a warm atmosphere. The wilderness setting and the cosy confines of a small yacht let you experience a new dimension of group bonding. Puffins listen to nature and travel with a flexible itinerary. We set goals, adjust plans to weather conditions and grasp opportunities to make the most of our trip. Safety is always our primary concern. We provide interested people with a detailed PDF brochure. Our expeditions are open to anyone in normal physical condition. You don’t need previous experience, a professional saiing crew takes care of the sailing. But off course, if you want to learn, you are most welcome to participate. The hikes and other activities are suitable for healthy people who enjoy being outdoors. Every programme can be adapted to the capabilities of your own group. Are you a private group of friends, family or colleagues interested in a Greenland cruise? Drop us a line and let’s start that wild dream together. Contact us in time, a yacht charter needs to be planned long in advance. Are you an invididual who wishes to sign up for our next upcoming scheduled expeditions? Fill out the form below, and we’ll get you on the list.